Saturdays, for us, usually means The Home Depot. (We love the Po!). We were kid-free yesterday, so after we got what we needed, we decided to look around a bit. My husband pointed something out to me that I thought I would share. You can get carpet remnants for a STEAL! A 12 x11 piece of brand new carpet for only $68! There was another, larger roll with what looked to be the same carpet – also for less than $100. Now, I know most people carpet large areas all at once, but if you just had one room (kid catastrophes happen!) 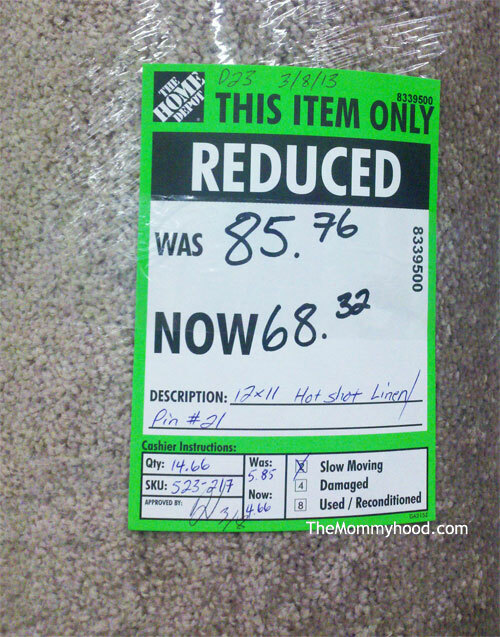 or maybe even two rooms to do – the remnant section at Home Depot is worth checking out! You can also have the edges of a remnant bound/surged or whatever you call it to make it into an area rug. I priced it once at a carpet place in downtown Knoxville and as I recall the binding cost was around $10/linear foot. Home Depot can probably do it for you (likely they would outsource it and profit a little from that part – hey, they are a business, so that is fair). To save money, you could take it somewhere and have the edges bound yourself. Of course that takes up your time, and costs you gas, which cuts into the savings. So maybe letting THD do it for you is the way to go after all. Anyway, the point is you could actually make an affordable area rug from a carpet remnant. Do you have any tips for ways to save money on carpet, rugs, or flooring?